No, I'm not still going on about Christmas related happenings. I'm talking yarn. Dirty Santa is this yarn's name. It's a bulky weight from Knitted Wit that I picked up at my LYS, Center of the Yarniverse, recently. As you can see, the yarn pooled a bit but Sarah was happy with the effect and that's all that mattered. I took Sarah to the yarn shop with me in hopes of her talking me out of buying anything. She's pretty good about that. She's usually immune to yarn fumes. Except... apparently not that day. She saw the skein hanging on the peg on the wall and announced that I was going to knit her a hat with it. And once I saw the name of the yarn, I had to agree. There was just no way I could not buy Dirty Santa. 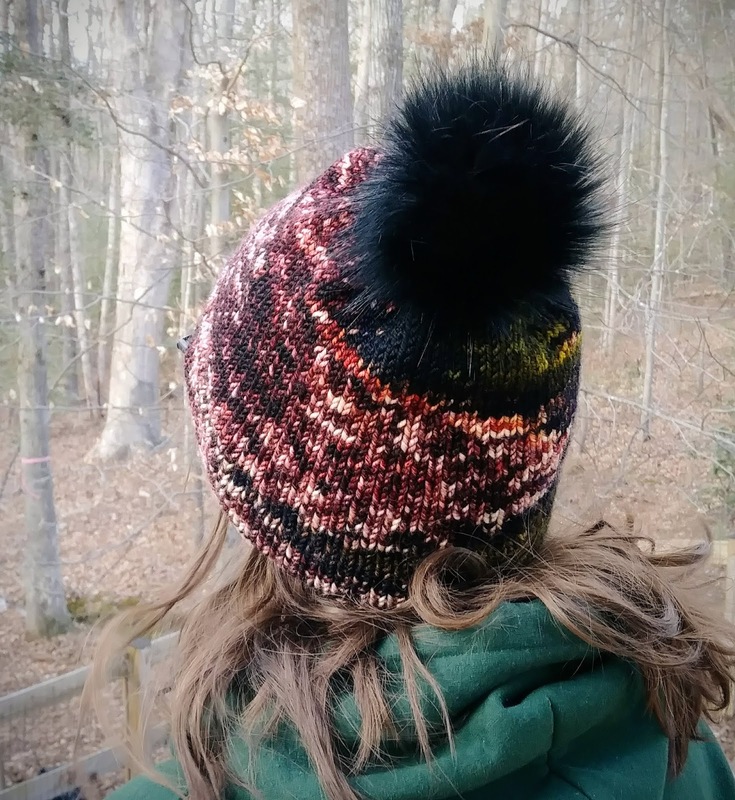 The hat knit up very quickly and the yarn was a delight to knit with. I don't normally like to knit with bulky weight - it makes my hands and wrists ache, but this yarn wasn't too bad. A fake fur pompom completes the hat and does a fantastic job of covering up my weird decreasing job. I was running low on yarn and had to get creative. 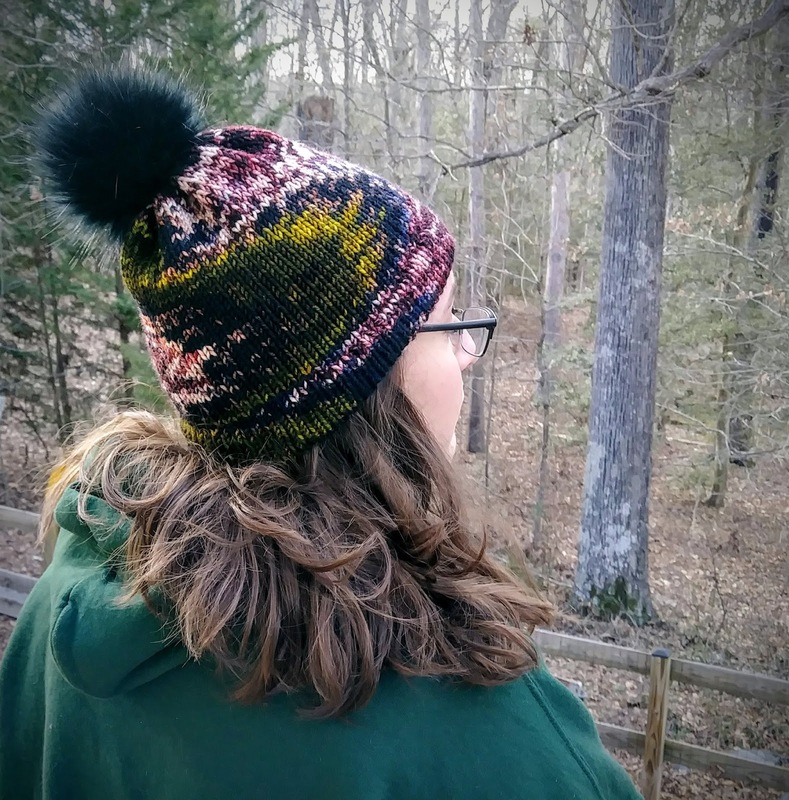 The hat has a hemmed brim which used more yarn than expected. After doing the crown decreases, I only had a few inches of yarn left to use for attaching the pompom. Despite the funky decreasing and a mean game of yarn chicken, Sarah and I are both quite happy with the hat. Love the name of the yarn, perfect! And I really love the pooling, it makes it a really unique hat. Those pom poms are just so great. I've never been a fan of yarn ones since mine are always too floppy but those are perfect! I love the name and i love the yarn too! I've made peace with pooling! I like the ppool - looks great and what a fabulous name for yarn!! So glad this post didn't slide off into weird territory. LOL! Love the hat!!! Love the Pom Pom, I need to find one that color.